If you are suffering with low back pain you are not alone, and you have three choices to help relieve and treat your pain. At Elite Sports Medicine & Physical Therapy we realize that any time somebody has low back pain, or, really, any kind of pain, they feel like they have a lot of different choices: you could go to a massage therapist, a chiropractor, your doctor, a physical therapist, get acupuncture, etc. -- you can do any number of things. What it boils down to is you have three major choices that you, your doct, or whomever can pick from. At Elite Physical Therapy we are not anti any of these, considering the right circumstance. For example, if you have somebody that has a very acute disc injury, or just had a car accident or something, medications can be invaluable with helping decreasing that initial inflammatory response. We are not talking about opioids, we are talking about anti-inflammatories like IB profen or tylenol, or a number of different medication options that can be used. Injections will fall under medications. There are some circumstances that injections are the right first choice. For the most part, with the exception of some major conditions, surgery should never be the first choice. Sometimes people are really quick to jump to medications, injections, surgery, instead of trying Physical Therapy first. You are getting a biased view from me, a physical therapist, but except for very serious pathologies, or what we call "red flags," where people have very serious things going on that need their medical emergencies that need to get addressed immediately, there is very little reason to not try physical therapy as a first line of defense. If you go to your primary care physician with low back pain, you're not alone, lots of people do. Of all the people that go to their primary care physicians for low back pain, they only refer about 10% to physical therapy over the course of that time period. At Elite Physical Therapy we think that that's a travesty and really sad because Physical Therapy can truly change the course of your recovery and ultimately, your life. 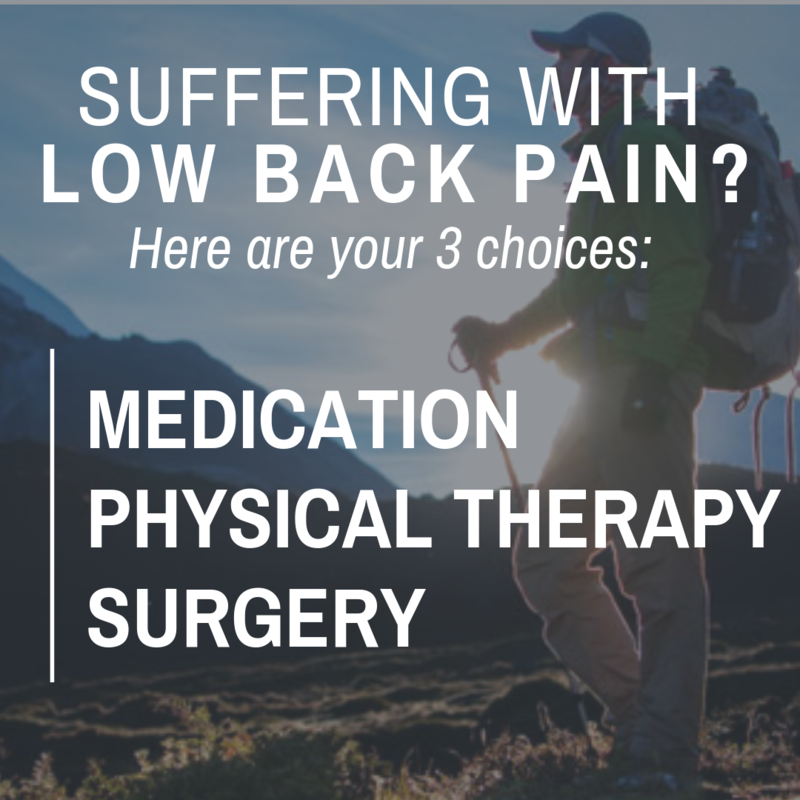 If you experience low back pain, keep in mind that you havve got three choices. How you handle those choices is really up to you. You're the patient. If you think that you want to give physical therapy a shot, you should!